Several years ago my husband Arnold and I went out to the driveway to our pickup. It was really raining. We didn't know one of our cats, Gray Kitty, was under the pickup somewhere to stay dry from the rain. When we started to back up it felt like we might have run over something. Our hearts sank. 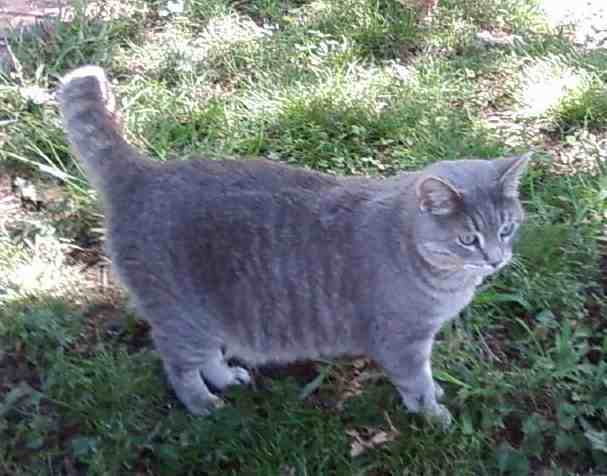 We immediately jumped out of the pickup and looked and saw Gray Kitty trying to walk. She was staggering. We thought at first we ran over her. We finally figured out she probably had climbed up on the drive shaft and fell off when the pickup started to move. Whatever it was, she was very frightened and trying to get away. We were just about hysterical at that point. I grabbed her and Arnold grabbed a box to put her in--no time to go in and get a carrier. Arnold thought she was probably dying. It was an extremely upsetting and a heartbreaking experience. 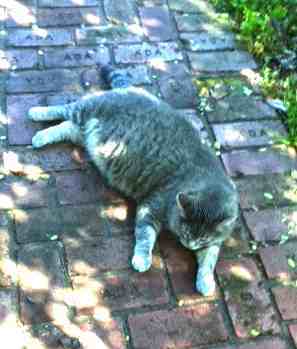 We loved Gray Kitty very much. 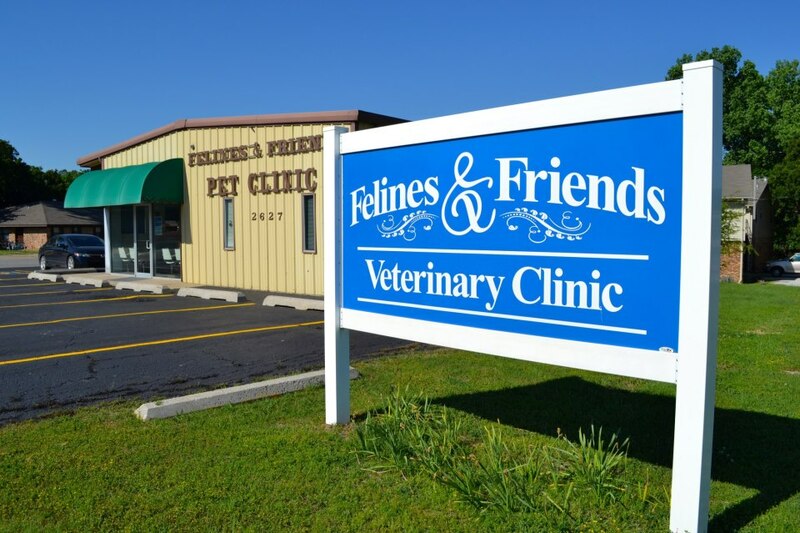 I immediately called our vet and we made a very fast dash to the veterinary clinic, Felines and Friends in Ada, OK.
Dr. Vickie Brandon quickly put us all in an exam room and she looked her over very thoroughly. She was badly injured but after a thorough exam including x-rays decided that she wasn't actually run over, but was somehow badly injured under the car, which was the same thing we were thinking. Dr. Brandon immediately gave her some anti-inflammatory and pain medications and some antibiotics. She was trying to keep any major swelling from starting. She kept her several days and nights at the clinic for treatment and observation and then we took her home. She probably was hit in face because she kept having swelling problems around her nasal area for several weeks. Also, she had to receive several weeks of Cosequin for recurring limping problems in one of her legs. Finally, our precious Gray Kitty got back to normal. We have never seen her go under another vehicle and any time it rains we keep her inside the house. We just can't get that memory of the accident out of our heads. We remember it like yesterday. It was a traumatic experience. Thank God she fully recovered. We felt Gray Kitty was rescued by several human Guardian Angels, but maybe helped by some unseen. It really seems like a miracle she survived. We have been blessed to have Gray Kitty as a part of our family. What a very sweet cat! We have never seen her angry or try to hurt another cat. March 30, 2018 Gray Kitty update: I am very sad to report that our dear, precious Gray Kitty passed away from severe kidney failure. She appeared to feel good until 2 days ago when she developed some worrisome symptoms. She looked like she didn't feel well and didn't appear to be eating much if any. She was drooling quite a bit. Dr. Brandon our vet did a complete blood test on her and very thorough physical exam this morning. She also had some sores in her mouth (that was causing the drooling) and her breath smelled quite bad. Dr. Brandon didn't feel like from her long experience as a vet that Gray Kitty could recover from that severe a case of kidney failure. So, we very sadly had to tell her goodbye. She was cremated and her ashes placed in a beautiful cat shaped urn. She is really missed and will be thought of with joy at her life, but sadness in her passing. We are very blessed that Gray Kitty came to live with us. We believe she felt the same way.